As technology advances, the most recent car models are becoming more equipped with keys and remotes embedded with a computer chip designed with unique codes that are customized to match your vehicle's ignition system. However, because of this new technology, and the numerous attempts by car manufacturers to make their cars more theft-proof, replacing and reprogramming a lost or stolen key can become pretty pricey. Aside from the fact that it’s time-consuming, depending on the model, in some cases, it can cost as much as $400 per key. In addition to how expensive key replacements can be, there is now a device that allows car thieves to steal your vehicle just by using a key fob potentially. No Bueno. The results were surprising - 19 out of 35 tests showed the device opened the vehicle. In 18 of those 19 entries, the device was also able to start the car and drive away. That means, more than 50 percent of the time, the potential perpetrator will be able to steal the vehicle. Car keys have an uncanny ability to get lost just about anywhere - from inside a coat pocket to forgetting them in a public place, the possibilities are endless. Now, before the 1990’s, it wasn’t a big deal if you lost your key. It was much easier to get a replacement at a hardware store or even at a dealership. But, as previously mentioned, today’s technology has made it quite expensive to replace a lost or stolen key. So, to avoid a potentially compromising situation, it’s super important to know the high costs of losing your car key and the advantages this gives to car thieves. Following the mid- to late-1990’s, car manufacturers started putting a transponder chip in the plastic head of the key. By sending a signal to a receiver in the ignition, the Transponder key can start the vehicle. Keep in mind, the transponder chip inside the key must be programmed before starting the car. 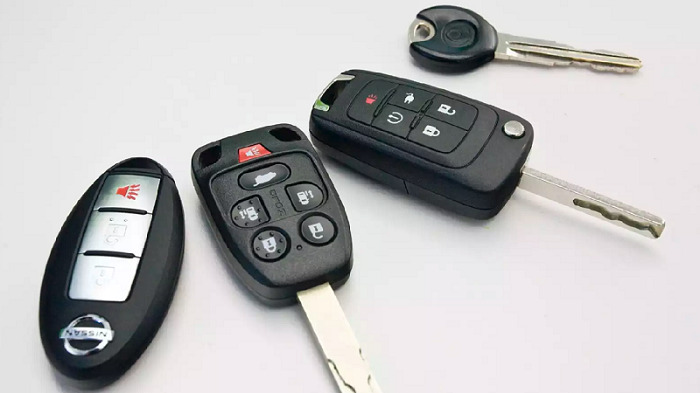 Most dealerships have the necessary machines to program the key, and in some vehicles, the Transponder key and the fob are an all-in-one unit - which automatically adds to the price if you ever need to replace it. To give consumers a better understanding, the latest Ford F-150 quoted $160 for the key plus an additional $75 for the fob. For those consumers who have a bad habit of frequently losing their keys, maybe consider saving a little money on the programming. Instead, create a third key to have as a spare. Often referred to as Sidewinder Keys, Laser-cut keys have a distinctive winding cut on the shank and also have a built-in transponder chip. Similar to the Transponder key, Laser-cut keys also need to be programmed at a dealership or locksmith. Because of Laser-cut keys having a more composite designed key shank, the machines required to cut these keys are significantly more expensive than a standard key-cutting machine and are harder to find at a locksmith or hardware store. According to Edmunds, all-in-one laser-cut keys are becoming more popular, but as we mentioned, these keys are more expensive and typically need to be replaced at the dealership. For example, including labor, a laser-cut key for a Honda Insight can range from $150-$250. Just for a car key! Switchblade keys are commonly seen today and have shanks that fold into the fob when not in use and pop out by pressing a small button on the fob. Contrary to the previously mentioned keys, the components of the Switchblade key can be purchased separately. If the key is damaged or no longer works, consumers can buy the key shank separately for about $60-$80. However, the more than likely scenario is a consumer losing their key, in which case, the consumer would need to buy both the key and the fob - offering a price tag of between $200-$300. Smart keys step out of the traditional key department and are fobs that are inserted into the dash. In the more advanced systems, the keys can also stay in the consumers pocket or purse, and the driver turns the car on and off with the press of a button. Rolling security codes is not the only form of security for the Smart keys; in fact, the system randomizes the correct code and prevents thieves from hacking through a device called a code grabber. By recognizing the code emitted by the smart key, the vehicle’s computer verifies the key before starting the engine. Usually included in the high-tech packages, nearly every single car brand offers a smart key. Furthermore, the only way to get a replacement is to go back to the dealer, and the cost of replacing and reprogramming a smart key can range anywhere between $220 to $400. Clearly, there’s no denying that modern keys are expensive to replace. Nowadays, it’s better to get a spare key, on your own terms, and avoid the added stress of it all. There are plenty of cost-cutting methods, so in the event that there is an emergency, you’ve got all your bases covered. At NowCar, we offer a huge selection of new cars at a low price and without the hassle of going into a car dealership.